In the glittering world of Hindi Film music the sun drenched radiant melodies from the films and their incandescent romantically linked lyrics have always played a very special role. Hummed by the common man and resonating all over the country these songs have a life of their own as they did in the day of yore when sung by stalwarts like K.L. Sehgal, Pankaj Mallik and K.C. Dey for the films emanating from Mumbai and Kolkata. When those stalwarts disappeared from the scene Manna Dey rose in the musical horizon as a shining star singing away an infinite variety of compositions with gay abandon. He has been reigning in the scene and enthralling millions with his lilting songs for five decades now and considering that natural voices and musical instruments held supreme in those days sans any manipulation by electronic gadgetry the emitted sound had to be crystal clear. For Manna now 85 it has been an outstanding achievement spanning all these years. The boy, Prabodh Chandra to his doting uncle K.C. Oey, the popular singer, composer and actor of the New Theatres, who gave him his name ‘Manna was taken under the tutelage of the veteran elder quite early, once the little one’s musical penchant was discovered. 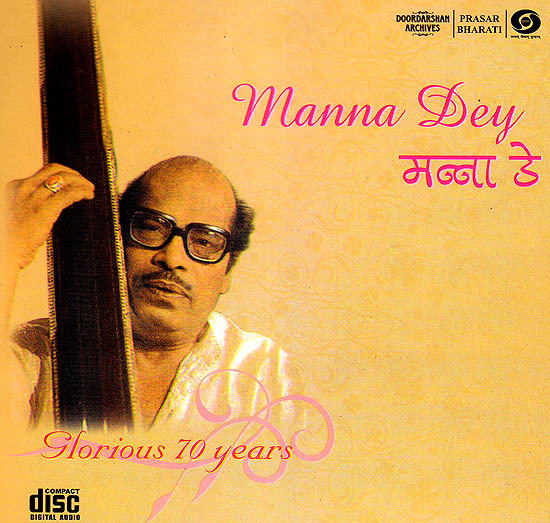 Young Manna grew up to the soft strains of Bani songs, Rabindra Sangeet and Khaya, before K.C. Dey put him through the paces, acquainting him with, besides the rigors of classical music, the semi-classical genres of Tappa, Thumr Bhajan and Qawwali. Freshly graduated Manna had set his heart on law and dreamt of becoming a barrister, before he found his uncle starting off for Mumbai in search of fresh pastures, after the disintegration of New Theatres in 1940. Manna decided to follow him and began a new career as the assistant to music director H.P Das. His first break came after a year with the chance recording of a solemn number for the character Valmiki in Vijay Bhatt’s Ram Rajya. The vastly talented singer struggled for some more time, and often wavered in his determination, but his marching song for Mashaal Upal Gagan Vishal turned into a super hit and made him decide to stay in the music line. The rest has been history. Says Manna I can’t stop singing I was born to sing and I will do so as long as I live an avalanche of his has followed in a flawless pursuit of his chosen muse. He has proven again and again his extraordinary flair for any type of song from Qawwali (Yeh Ishq Ishq Hai) to romantic duet (Pyar Hua Iqraar Hua) fast number (Aao Twist Karain, Jhoomta Mausam Mant Mahina) to patricotic song (Aye Mere Pyare watan) or prayer song (Tu Pyar ka Saagar Hai) a versatile genius with a multi faceted voice, Manna has shown total mastery over a string of semi classical Geeta like Laga Chunri Mein Daag: Tere Naina Talash Karen Poocho na Kaise Aaay kahan se, Maaro aaj mile man ke Moti and Tum Bin Jeevan. Manna’s major contributions to music lie in his catholicity of approach Says he. I like melodic compositions of Maharashtra in its puaraa, Bhao Geet and Abhang with different colors as much as geet from Gujarrat and Saurashtra with their typically. I’ve always considered. In my learning path the need to traverse as many territories as possible in order to become a competent singer so that I don’t have to beat a retreat ever he also remains a perfections who believes in making comprehensive notations and coming prepared for recording after as many rehearsals as possible. He in fact encouraged Lata and Asha into following notations wit varying enthusiasm! In sheer technique his deep knowledge of Taan. Palte, Murki and Gamak that he inherited from his uncle has stood him in good stead in injecting variety in his vocal elaboration combined with subtlety melodiousness and pathos that he would introduce himself. No wonder his forays into Dhrupad, Khayal, thumri, Tappa, Baul, Keertanand Ghazal are touché with a rare élan making him the complete musician.